Although it has been nearly a century since the 1915 publication of C.J. 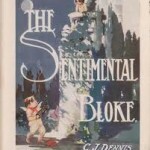 Dennis’ verse narrative Songs of a Sentimental Bloke, Dennis’ comic use of the Australian vernacular continues to endear the work to contemporary readers. The Songs tell a humorous love story as Bill ‘the Bloke’ tries to reform his rough larrikin habits in order to win the affections of Doreen, a young pickle factory worker. The book is full of examples of Australian colloquialisms, particularly words relating to the world of the urban larrikin (then a word meaning ‘hooligan’). Dennis’ use of Australian English is especially striking in the verse titled ‘The Play’, which details Bill and Doreen’s visit to a performance of Shakespeare’s Romeo and Juliet. In this verse, Dennis masterfully recounts Shakespeare’s iconic play and Bill’s reaction to it using distinctively Australian terms. When Bill tells the reader of the feuding families at the centre of the play, he describes the Capulet family as the cliner’s push. Both these words are first recorded at the end of the nineteenth century: a cliner is a ‘girl or girlfriend’ (first recorded in 1895), while a push in the sense used here is a ‘gang of larrikins’ (first recorded in 1882). To put in the boot (first recorded in 1907) is an idiom meaning to ‘attack savagely, especially when the opponent is disadvantaged’. ’Ead over turkey, an’ ’is soul ’as flit. This colourful use of Australian vernacular clearly struck a chord with readers; the book sold 100,000 copies within four years of publication and was subsequently adapted for film (1919 and 1932), television (1976) and a stage musical (1961). The 1919 silent film adaptation directed by Raymond Longford and featuring Arthur Tauchert as Bill is considered one of Australia’s finest films. The contemporary press often reported with particular pride on the favourable reception of this film adaptation in the ‘mother country’. 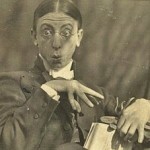 In 1920, the Port Pirie Recorder proudly relayed a London critic’s view ‘that it was the best film he had ever seen’ and in the same year the Sydney Morning Herald also reported on the success of the film in London, noting that ‘none of the language was changed—the slang seemed to appeal to the people’. London critics may not have gone so far as to suggest that Dennis was Australia’s bard, but the popularity of Songs of a Sentimental Bloke indicates that Australians reveled in Dennis’ celebration of their nation’s distinctive vocabulary. * Harriet Mercer is currently an Honours student in the School of History, College of Arts and Social Sciences, Australian National University. This entry was posted in popular culture, slang, urban Australia, writers and tagged CJ Dennis, cliner, colloquialisms, film, gazob, head over turkey, larrikin, push, put in the boot, Sentimental Bloke, slang, theatre by Amanda Laugesen. Bookmark the permalink. Previous OzWords post on Dennis, with some discussion in comments.